Finding the perfect engagement ring to match your partner’s style isn’t as easy as it seems. Especially if the engagement is a surprise. You want the right piece for the person you love, but you also want her to adore it too. When you slide the ring on her finger, you want a resounding yes, followed by It’s perfect! But perhaps choosing jewelry isn’t your thing. Probably, you love your partner but are a little unsure what style of ring to choose. At David & Son’s we can help you select the perfect engagement ring. If you had to describe your partner in two words, what would they be? If your partner enjoys moonlit walks on the beach and surprise getaways, she might be a romantic. Her classic style of always having the right handbag to fit any occasion makes her a perfect candidate for a Princess Cut diamond engagement ring. Slip the ring on her finger and watch her face blush in thanks. When you walk into your partner’s home is everything chic and modern? Do clutter and disorganization make her crazy? She might enjoy a modern engagement ring that makes a big statement without any frivolous touches. One excellent choice is the Oval Cut with a line of small diamonds stretching down a silver band. Nothing extra but everything big. Is your partner’s favorite television show is, Keeping Up with the Kardashians? Then she definitely loves to be stylish. When she walks into a room, everyone turns to stare and for a good reason— she looks fabulous. 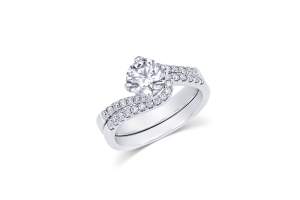 Women who fit this style love the Marquis Cut diamond engagement ring flanked with diamonds. Perhaps, your partner is more comfortable outside in the open air, wearing her favorite pair of hiking boots. She needs a ring that doesn’t get in the way of exploring the outdoors. She might like a simple wedding band of glittering diamonds or a Round Cut ring that won’t catch on any fabrics. She needs something perfect for on the go. Your partner enjoys the simple things in life. She prefers cozying up by a fire, reading a good book, and sipping wine. Her idea of a night out is spending it with you. One engagement ring style she’ll love is the Diamond Cut. The simple and elegant design makes it a perfect choice. No one keeps your baby in the corner. She’s unique and creative. She combed thrift stores before the hipsters made them popular. You need a diamond engagement ring that’s unlike any other. One popular choice is the Pear Cut. She’ll be the only one in the room with this style. David and Sons crafts original pieces with fine diamonds. Our in-house designers will work with you to find the perfect ring to fit your partner’s unique style. We can show you how to match your partner’s style with a timeless engagement ring. Give us a call today! Wedding Rings – Which Type of Gold is Best?